Historic resources, which include buildings, districts, bridges, public art and landscapes, are structures and places that connect the past to the present. They not only enrich our built environment and sense of place, but also provide perspectives on who we were and who we are - as individuals and as a community. Check out our Story Map to learn more about sites on the National Register of Historic Places in Roanoke County! This webpage provides information on historic resources in Roanoke County as well as links to other sources of information such as the Virginia Historical Inventory and the Library of Congress' Digital Collections. For additional information on historic resources or preservation efforts in Roanoke County, please contact Megan Cronise by email or by phone at (540) 772-2106. A study with the goal of identifying and documenting as many inactive, family cemeteries in the Roanoke Valley as possible and collecting information to facilitate their protection and study as important components of our cultural landscape (1.5 MB). A survey of over 400 historic resources in Roanoke County including all antebellum buildings and structures as well as outstanding examples of cultural resources built after 1861. These resources may include buildings, structures, site and landscapes (9 MB). A survey of 37 sites in Roanoke County which have been identified as having particular historic architectural significance (4 MB). Access to print, pictorial and audio-visual collections and other digital services. 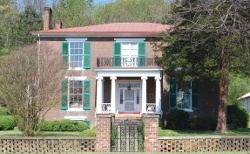 The National Register of Historic Places is the official list of the Nation's historic places worthy of preservation. A private, non-profit organization and statewide historic preservation organization. Online collection of both archival and newly made maps. relevance, preserve historical documents and artifacts for future generations, promote educational opportunities for the community and partner with the Town of Vinton and County of Roanoke to provide a museum worthy of the citizens of Vinton. An online search engine providing interactive access to photographs, maps, and detailed written reports documenting the architectural, cultural, and family histories of thousands of 18th- and 19th- century buildings in communities across Virginia. This collection was originally assembled by the Virginia Writers' Project, part of the depression-era Works Progress Administration. Report, photograph, and map images are available online. The Virginia Landmarks Register lists all Virginia resources approved for inclusion on the Register. Many of these resources are also listed on the National Register of Historic Places.